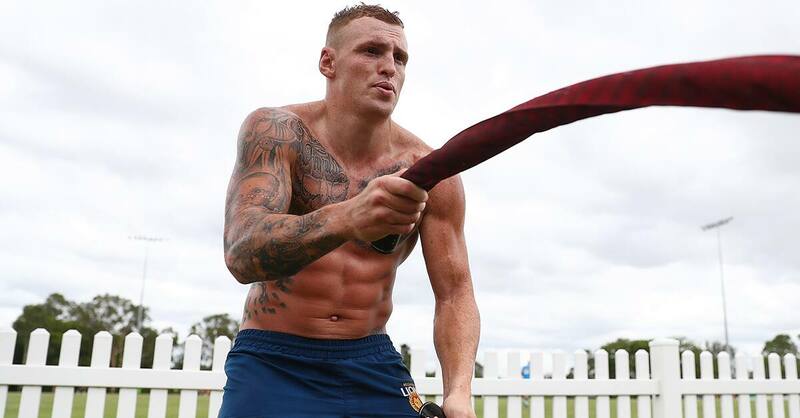 Mitch Robinson concedes he didn't handle injury too well last year. Whether it was mentally dealing with his broken foot or doing the rehabilitation to repair it, the Brisbane hard-man says he just wasn't coping after the initial diagnosis. Robinson suffered the fracture in round seven against Sydney and didn't play again in 2017. But since returning to pre-season training two weeks early, the 28-year-old is hungrier than ever to play a major role in Brisbane's attempt to head north on the AFL ladder. "I probably didn't handle it the best in the first two months," Robinson told AFL Media. "Just mentally, rehab, the pressure of home with kids and trying to make sure they're happy … it wasn't much fun being in a moon boot. "You have your own schedule, you barely see anyone, it's really tough. "I was selfishly thankful 'Belly' (Tom Bell) broke his foot because I had someone to rehab with. "I didn't handle it very well." Robinson said he was now rejuvenated and re-energised and saw the injury as a positive, a chance to prolong his career after missing so much of last season. Since coming to the Lions and finding a home as a tagger, the former Carlton midfielder morphed into a pressuring half-forward that could compete onball early last season. Robinson needs versatility, because with Allen Christensen also back this season after a long injury layoff, and the injection of No.1 draft pick Cam Rayner, the fight for positions will be tight. He is doing everything possible though, including running a 3km personal best during the pre-season. "I see myself starting half-forward but playing 50-50 midfield," Robinson said. "We've lost some experience in 'Rocky' (Tom Rockliff to Port Adelaide) and we can't have too many young blokes in there. "When you have a year out, people forget what you can do. "Hopefully the old bull can get through the midfield and win that footy."